Let’s be honest, emotional abuse doesn’t make media headlines because it doesn’t sell. Yet journalists rarely report the fact that up to 30% of intimate partner homicides are committed in relationships with no previous history of violence. Emotional abuse can be just as damaging, if not more so than physical abuse. Yet it’s rarely reported. 1. It’s often so manipulative, that you might not be able to put your finger on what’s happening. 2. It doesn’t leave any visible scars for the outside world to 'gasp' about. I feel like I’m losing my mind, but I just can’t explain it to the outside world? I must be exaggerating how bad it is, because he hasn’t actually hit me. I feel like a former shell of myself, but he’s never hit me, so how bad can it be? If you’ve ever felt like you were going crazy or have lost your mind since entering your relationship, you ARE in an abusive relationship. Emotional abuse is not the same as angry outbursts, occasional name calling or hurt feelings. It is a specific pattern of power & control, designed to methodically chip away at a person’s self esteem & destroy their independence, for the sole purpose of keeping them under the control of the abuser. Healthy relationships are based on trust. The ability to clarify an issue or raise a grievance with your partner, family member or friend, should feel safe. If you feel crazy or are treading on eggshells, your relationship with that person is emotionally abusive..
Once you have that ‘aha’ moment & realise you’re not to blame, you’ll wonder how you ever missed how deceptive emotional abuse can be. 1. Have you heard of Gaslighting? In short, it’s a manipulative technique used to rewrite or reinvent the reality of what occurred. An event happens, you saw or heard it happen, you may even have proof that it happened, yet your partner denies it. Despite having solid proof of the incident, your partner still denies it & you end the conversation feeling like you must be losing your mind. Your reality (the truth) has just been re-written by the person gaslighting you. You are crazy! That never happened! That’s not true! This leads to treading on eggshells & other crazy making control tactics we’ll cover shortly. People with low emotional intelligence (abusers) believe that if they punish their victims for long enough, the victim will eventually see the ‘error of their ways’. By rendering the victim voiceless & showing them how insignificant they are through their cruel silence, the perpetrator maintains a faux sense of power & control. He or she diminishes the person’s existence & deny’s them of their human need for love & connection. In some warped childish way, this is supposed to ‘teach the victim a lesson’ & show them the ‘consequence’ of standing up for themselves in future. But what happens when you try & address an issue with an abuser or hold them accountable? This is where try & try as you might to address the issue, the abuser does a switcharoo on you. He or she changes the topic at every turn, until you lose track of the point/grievance you attempted to raise. For example you start out addressing how their behavior is causing harm, or how their failure to meet responsibilities is letting people/you down. Then somehow the conversation shifts & ends with the entire focus being on YOUR faults, how you are attacking them & how YOU are abusive! RED FLAG > It’s well known that abusers spend an extraordinary amount of time focused on other peoples faults. Diversion from topics & blame shifting are part of emotional abuse. E.g. You start out with a succinct, valid point. But now you’re being told you’re passive aggressive. So the conversation ends with WTF, am I losing my mind?! The abuser has more tricks up their sleeve that will ensure you’re deemed ‘crazy’. 4. What Is Emotional Baiting? This is where the abuser ensures that you look like the ‘crazy one’. They have methodically studied your vulnerabilities (the ones you thought you were sharing with someone you trusted), then WHAM! Out of nowhere they use your privately shared traumas or fears to push your buttons until they get a reaction. In another post we covered the different personality styles of abusers. And emotional baiting fits the profile of the ‘water torturer’. … Your deepest fears & vulnerabilities were already noted early on in the relationship. They were stored in a mental filing cabinet, waiting for just the right timing. Despite the obvious craziness of it all, many victims continue to attempt rational conversations. Which only leads to the abuser increasing their manipulative tactics. Whilst gas lighting attempts to completely rewrite or reinvent the reality of what occurred, minimising down plays the facts. Although there is a small difference between the two, the distinction is important. With minimising, there is a tacit admission that the event occurred, but your reaction to the event is deemed irrational or unstable. You really need to chill out/calm down. This constantly chips away at your self esteem by denying your right to feel angry or frustrated over their behavior. And it keeps you in a constant loop of self doubt. While you’re stuck in a downward spiral of questioning yourself, the abuser escapes all responsibility for the grievance you raised. Abusers commonly rewrite reality, even in the face of solid proof. They are rarely accountable, even when presented with 'being caught in the act'. They have extremely hostile reactions to being questioned/pin pointed on the truth. They have irrational reactions to (perceived or real) rejection. Silent treatment/ostrasization is one of the most insidious forms of abuse used as a method of control. One last important point that adds extra trauma for many victims of emotional abuse, is that some perpetrators have undiagnosed personality disorders. Whilst many media articles & blog posts are raising awareness of narcissistic personality disorder, underlying narcissism shares many traits with other personality disorders. Extreme reactions to rejection or abandonment in borderline personality disorder, can lead to “If I can’t have you, no one will.” Yet because the personality disorder goes undetected in couples counselling, it can leave the victim of emotional abuse in extreme danger. To complicate matters further, in couples counselling, the perpetrator of abuse may be misdiagnosed as being “depressed”, because the clinician misses the underlying narcissism. In other words, the source of the perpetrators depression is because his perceived ‘entitlement’ to a perfect woman, is not matching up with what life is reflecting back to him. Thus, his partner is encouraged to deal with his symptoms of “depression”, rather than identifying that he is abusive because of an underlying personality disorder. The impact of emotional abuse should never be minimised. Although the word ‘domestic violence’ is used in our content, this is never with the intent of minimising the impact of emotional abuse. Irrational jealousy, stalking, coercive control & obsessive monitoring of daily activities can be lethal. If you, or someone you know is experiencing emotional abuse, please contact your national domestic violence hotline. 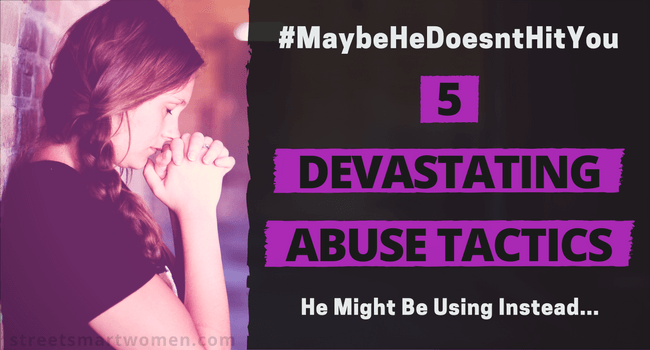 In this article, we use the word ‘he’, whilst acknowledging abuse is perpetrated by both men & women & effects people of every age, race, religion, class & sexual orientation. Sadly, most victims of emotional abuse only understand they were in an abusive relationship after it ends. By sharing this post we can change this. Please help spread the word that any form of abuse is not ok & emotional abuse can be just as dangerous as physical abuse. It’s such a relief to know this is a real situation/condition/disorder, whatever you would like to call it, I’m not crazy after all, Well I feel as I am now considering all the craziness my boyfriend narcissist has inflicted upon me. For over ten years he has displayed and used every manipulative tactic mentioned in the above article and then some, he’s a textbook narcissist through and through. I just recently discovered these issues as well as the millions of those whom are affected by them, I felt immediate relief, joy, and sadness along with anger, hurt, and pain. It’s been miserable and exhausting and consuming. Just knowing I’m not alone has been my sole motivation to educate myself as much as I can and gives me the opportunity to deal with it and do something about it. I would like to add a few more thoughts that I feel are important, I honestly don’t know which is worse of all the tactics of manipulation the silent treatment or the gaslighting, they’ve changed me in such a way I have no words to express what I mean exactly, it’s very cruel and it forever leaves its mark on you.